Get festive this winter season with Emirates’ tailor made holiday sweaters and pyjamas. Available at the Emirates Official Store and online, essential holiday wear is now available in time for a cozy winter night at home, stocking stuffers, as well as special occasions and gatherings with friends and family. Shop for little ones this holiday season and surprise them with a festive Emirates pyjama set. Both are embroidered with Emirates pilot and cabin crew design with cross stitches that resemble small hearts. 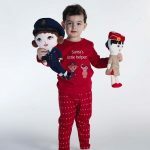 The festive Emirates onesie is available for newborns and children up to 18 months, retailing for USD$ 26 and the full pyjama set is for children aged between 2 to 8 years old, retailing for USD$ 37.